9th February 2019 - 9.30am - 10.30am. For more information and to register, see our Calendar or our Hookin2Hockey page. The 2019 Club Open/Registration Day will be held on 24 February 2019. 11 am - 1 pm. The latest President's Pitch is now available. YVHC is currently looking for an expression of interest for Junior Coaches in 2019. Welcome new WPL coach to the Dam for 2019! The YVHC Board is excited to announce the appointment of Adrienne Glancy as the Women’s Premier League coach for 2019. 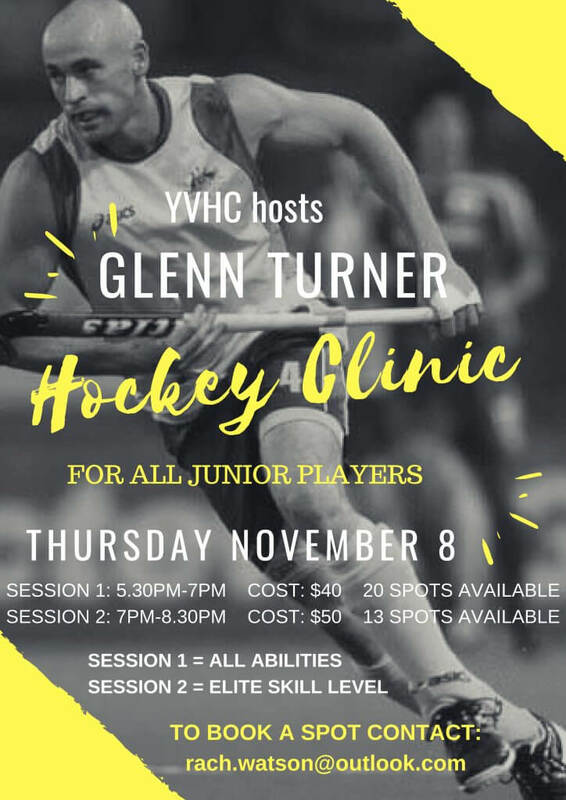 A fantastic opportunity to get some coaching from Glenn Turner - Ex Hockey Kookaburras Player!